On New Year’s Eve, Pope Francis received in audience the participants in the 40th International Congress of the Pueri Cantores, which was held in Rome, Dec. 28 – Jan. 1. Here is a translation of the transcription of the Pope’s conversation with the young choristers in the course of the meeting. First question: What do you think of our singing? Do you like to sing? Pope Francis: “What do you think of our singing? Do you like to sing?” … I would like to hear you sing more! I heard only one song; I hope you sing others … I like to hear singing but, if I sang, I would be like a donkey, because I don’t know how to sing. I can’t even speak well, because I have a defect in my way of speaking, in phonetics … But I very much like to hear singing. And I will tell you an anecdote.. When I was a child — we were five brothers – when we were children, at 2 o’clock in the afternoon on Saturdays our mother made us sit in front of the radio to listen. And to what were we listening? Every Saturday a [lyrical] opera was broadcast. And mother taught us about that opera. She would explain: “listen how he does this …” And as a child I experienced the pleasure of hearing singing. However, I was never able to sing. As well, one of my grandparents, who was a carpenter, always sang while he worked — always. I learnt the pleasure of hearing singing as a child. I so like music and singing. And what do I think of your singing? I hope to hear others. All right? Is it possible? I’ll tell you something: singing educates the soul; singing does good to the soul. For instance, when a mother wants to have her child fall asleep, she does not say to him: “one, two, three, four” … She sings a lullaby … she sings it … and it does good to the soul, and the child becomes peaceful and falls asleep. Saint Augustine said a very beautiful phrase. Each one of you must learn it in his own language. Speaking of the Christian life, of the joy of Christian life, he said this: “Sing and walk.” Christian life is a way, but it isn’t a sad way; it is a joyful way, so he sings. Sing and walk, don’t forget! Each one must say it in his own language: sing and walk! [They repeat: “Sing and walk!”] I haven’t quite heard it … [“Sing and walk!”] There. Remember this: sing and walk, and so your soul will enjoy more the joy of the Gospel. Second question: How is it that you are always so good? Do you ever get angry? What are your good resolutions for the New Year? 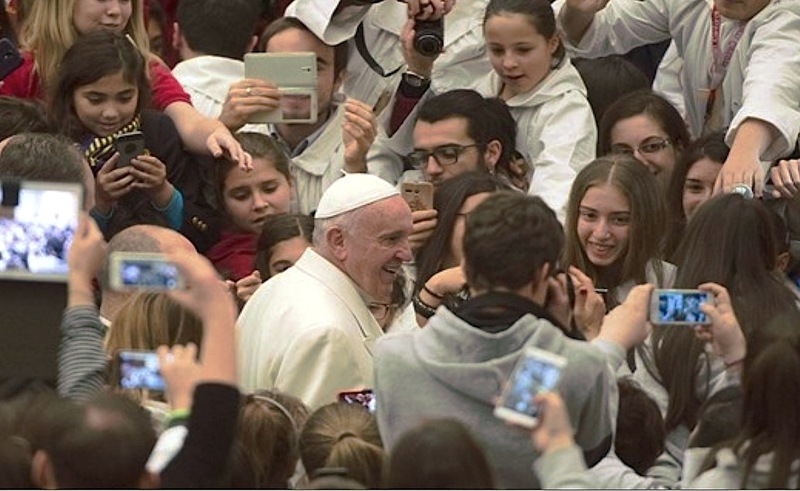 Pope Francis: Jesus once approached a boy who said a word similar to yours. He said: “Jesus, good Teacher.” And Jesus looked at him and said: “No, God alone is good.” God alone is good, Jesus said. And we? Are we evil? No, half and half, we have a bit of everything … We always have that wound of original sin that leads us not to be so good always … But always remember: God alone is good and, if you want to find goodness, go to the Lord. He is all goodness, all love, all mercy. And do you know what I do to be somewhat good? I come close to the Lord. And I ask the Lord: “Lord, may I not be such a sinner, may I not be so bad, may I not do evil things to anyone; may I not have jealousies, envies, may I not get roped in, in so many ways …” — and all these things. Ask for the grace to be good, because God alone is good. You must also learn this. Shall we say it all together? Each one in his own language: “God alone is good.” [They repeat: “God alone is good”]. Once again. [God alone is good”]. Remember that advice of Saint Augustine, which you all repeated together. What was it? [They answer: “Sing and walk!”] God alone is good. Remember this well. But, yes, there are good persons, who come close to the Lord, the Saints! so many hidden Saints in daily life, in our life, so many persons that suffer and offer their sufferings for the conversion of sinners. so many, so many people that come close to God’s goodness; they are the Saints. But who alone is good? [They answer: “God”]. God alone is good. The other question: “Do you ever get angry?” Yes, I get angry, but I don’t bite! Sometimes I get angry, when someone does something that’s not right, I get a bit … But it helps me to stop and think of the times in which I’ve made others get angry. And I think and ask myself: Have I made someone else get angry? O yes, many times. Then I don’t have a right to get angry. But he has done … Yes, if he has done a bad thing, which is not good, call him and talk to him as a brother, speak to him as a brother and sister, speak, speak, but without getting angry, because anger is poisonous, it poisons your soul. Many times I have seen children and youngsters scared. Why? Because parents shout at them, or they are shouted at in school. And when one is angry and shouts, it does harm, it wounds: to shout at another is like stabbing the soul; it doesn’t do good. Have you understood this well? I get angry, yes, sometimes I get angry, but it helps me to think of the times in which I have made others get angry, this calms me somewhat, it makes me more tranquil. To get angry is something that not only harms the other person, but it harms oneself, it poisons one. And there are people, whom you undoubtedly know, that have a bitter spirit, who are always bitter, who live angrily. It seems that every morning they brush their teeth with vinegar to be so angry! People who are like this …: it’s a sickness. We understand that if there is something that doesn’t please one, one gets a bit angry. However, the habit of getting angry, the habit of shouting, the habit of chiding others, this is a poison! I ask you, and each one answer in his own language: how was Jesus’ spirit, gentle or bitter? [They answer: “Gentle!”]. Why was He gentle? Because when He got angry it did not reach His soul. It was only to correct, and then he returned to peace. “What are your good resolutions for the New Year?” I made one these days, in which I took some time to make a spiritual retreat: to pray more. Because I am aware that Bishops and priests – I am a Bishop – must govern the People of God first of all with prayer; it is the first service. I’ll tell you a story. At the beginning of Christianity there was so much work to do because so many people were converting and the Apostles didn’t have time. And some came to complain that they didn’t take good care of the widows and orphans. It was true, but they didn’t have the time to do everything. And they held a council among themselves and decided to charge some men solely with serving the people. It was the moment of the creation of deacons, so deacons were born. You can see this in the Book of the Acts of the Apostles. And what does Peter say, Saint Peter, the first Pope? What does he say? “They will do this, and we, the Apostles, will engage in only two things: prayer and the proclamation of the Gospel, preaching.” That is, the first task of a Bishop, the first task is prayer: one can’t be a Bishop in the Church without having prayer in the first place — and then, the proclamation of the Gospel. Responding to your question, in these days I’ve thought that a good resolution for the coming year would be this, to pray a bit more. OK? I also ask you: do you think that this would be a good resolution for you also? [They answer: “Yes!”] To pray a bit more, as the Church goes forward with the prayer of the Saints. Pray for the Church! Third question: When you were little, what did you dream of becoming? In the evening, when I watch television with my family, I see so many sad and tragic stories: will the world always be like this, also when I grow up? Pope Francis: If I were to say the truth on the first question, I would make you laugh… But I will say the truth. The question was: “When you were little, what did you dream of becoming?” When I was small, I often went with my grandmother, but also with my mother, to do the shopping. At that time, there were no supermarkets, no television, there was nothing … The market was on the street, and there were places for the vegetables, the fruit, the meat, for the fish and everything was bought there. One day, at home, I was asked at table: what would you like to be when you grow up? Do you know what I said? A “butcher.” Why? Because the butcher that was at the market – there were three or four places for meat – he took the knife, cut in pieces … it’s an art, and I liked to look at it, I enjoy it. Now, obviously, the idea has changed; however, responding to your question, when I was small I thought of becoming a butcher. It would have pleased me. Then, the second question – this one is serious! –: “In the evening, when I am at dinner with my family, watching television, I always hear talk of sad and tragic news … But, when I grow up, will the world always be like this?” What you say is true. There are so many people suffering in the world today. There are wars. But how many wars are there? Think of how many wars there are in Africa. In the Middle East, where Jesus was born, everything is at war – war in Ukraine, in so many places. There are wars in Latin America. They are awful things! And what do wars do? They create poverty, cause sorrow and harm. Only sad things … Think of the children. You, boys and girls, little boys and little girls, have God’s gift to be able to sing, to be happy, to live the Christian life as Saint Augustine said – what was it that Augustine said? [They answer: “Sing and walk!”] –, but there are children in the world who have nothing to eat; there are children that can’t go to school because there is war, poverty, and no schools; there are children that, when they get sick, have no possibility to go to a hospital. Pray for these children. Pray! But will the world always be like this? The world can improve. But there is something that it’s not nice to talk about, but of which one must speak: there is the fight between good and evil in the world – say the philosophers — the fight between the devil and God. This still exists. When the desire comes to each one of us to do a bad thing, that little evil is an inspiration of the devil that, through the weakness that original sin has left in us, leads us to this. Evil is done in small as well as in big things; in wars as well as, for instance, when a boy or a girl lies: it’s a war against the truth of God, against the truth of life, against joy. This is clear, no? Have you understood this? It’s clear. We all have a battlefield within us. We all struggle between good and evil. We have graces and temptations, and we must speak with the parish priest, with the catechist, about these things to get to know them well. This is the first. The second: there are so many good things in the world, and I wonder: why aren’t these good things publicized? Why does it seem that people like to see bad things more and hear awful news. We think of Africa: so many evil things, so many wars – as I’ve said – but there are missionaries, priests and sisters, who often have spent their whole life there, preaching the Gospel, in poverty … When I went to Africa last month, I met some little Sisters .,.. I am thinking of one who was 83, she was Italian, and she said to me: ”I have been here since I was 26.” And there are so many holy families, so many parents that educate their children well. Why don’t we see on television a family that educates well, which educates a child well? We don’t see it! Because there is this attraction to evil: it seems that it’s more pleasing to look at bad things than at good things, than at great things. The devil does his part — this is true –, but God also does His part: there are so many holy people! Not only in the missions but in the world, in work, in families; so many parents, so many grandfathers and grandmothers that endure sickness, problems and this isn’t seen on television. Why? Because this has no rating, no advertising … Here, in Italy, I’ve discovered so many associations, men and women, who give part of their time to care for, to accompany, to look after the sick. This is good, but this isn’t seen in the advertising. Is this true or not? If one wants to have rating—whether of journalism, television, or whatever one wishes – you must show only bad things; people are bored with good things, or they don’t know how to present and do things well, to have good things seen well. When you [he turns to the girl that asked the question] watch television, in your home, remember these two things: there is a fight in the world between good and evil; there are so many children that suffer; there are wars, there are evil things, because the fight is between God and the devil; but also think of the many people, the many holy people, the many people who give their life to help others, to pray for others. But why are cloistered nuns, who spend their life praying for all, not seen on television? This doesn’t interest … More interesting perhaps are the jewels of an important firm, made to be seen … things that cause vanities. We must not let ourselves be deceived! There are awful, awful, awful things in the world, and this is the devil’s work against God; but there are holy things, holy things, great things that are the work of God. There are hidden Saints. Let us not forget this word: the hidden Saints, those that we don’t see. OK? I thank you for all this. However, I would like to hear another song to say if I like or don’t like the way you sing … And something else: I would like to hear repeated how Christian life was according to Saint Augustine? What must one do? [They answer: “Sing and walk!”]. Sing and walk! Second: who is good? [“God alone is good”]. There. And now I expect a beautiful song … Thank you! Pope Francis: Now I can answer: you sing very well! Thank you! I give you my blessing and also my good wishes for the New Year. And tomorrow we will see one another in the Basilica; it will be a pleasure.